N. H. BUCHANAN MOTOR CO. The N. H. Buchanan Motor Company used racing to promote the fibreglass bodies they were producing at their factory in Annandale, NSW. Nat Buchanan, his partner Jock Morgan and "Works" driver Bruce Maher, built up the first "Works" racer on a MG TD chassis with a TF engine. The "Works" Buchanan MG went on to record 12 1st. place finishes in its first nine weeks of competition, a fact they were keen to promote in their magazine ads and press releases. With success in racing came the orders, 80 bodies were built by the end of 1957 and by March 1958 100 had been sold. Later in 1958 Buchanan sold the moulds to J & S Fibreglass to free up capital to fund his next project, the Buchanan Cobra. As Buchanan expanded his business new distributors were set up in each state. In Tasmania, Max Stephens was the Buchanan agent and bought the "Works" car as a demonstrator. 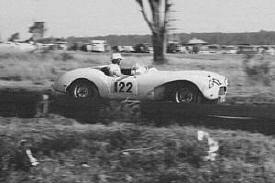 Based in Hobart, he campaigned the Buchanan MG at the local Baskerville road race circuit. In the hands of John Contencin it recorded 1st at the February 1958 inaugural meeting. Norm Baker in Launceston ended up with the car next before it passed into Graham Springer's hands.